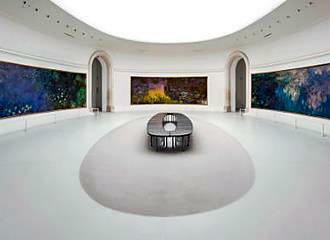 This museum in Paris is located within an old orangery building in the Tuileries Gardens and houses the famous water lily murals style large painting from Claude Monet along with a collection of paintings include some from Picasso, Renoir, Cezanne, Matisse, etc. The Orangerie was first constructed in 1852 within the Jardin des Tuileries in order to house the orange trees of the garden, and it was initially designed by the architect Firmin Bourgeois, yet completed by his successor Ludovico Visconti. Over the years the Orangerie building had many different uses including being utilised for filing materials during the Third Republic, then for temporary exhibitions, as a horticultural hall, and a place to stage different sporting and musical events. But in around 1921 it was decided that both the Orangerie and the Jeu de Paume buildings, which are located opposite each other in the Tuileries Gardens should be utilised as museums and these were annexed to the Musee du Luxembourg. Now, the artist Claude Monet wanted to donate some of his paintings to the state, and so with the help of his friend Georges Clemenceau it was organised that they would be displayed within the Orangerie. And in 1922, Camille Lefevre, who was the architect for the Musee du Louvre at the time, drafted plans for the interior decoration in which to hold the large mural style paintings. 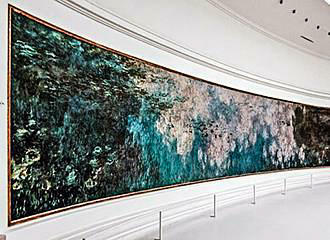 Although the paintings remained with Claude Monet until his death in 1926, they were then installed within the Orangerie, and in the May of 1927 the Musee de l’Orangerie opened to the public. 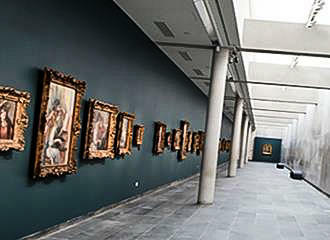 Another major and very important art collection is also housed within the Musee de l’Orangie, which is known as the Walter-Guillaume collection that was first compiled by the art dealer and literary intellectual called Paul Guillaume, and it was his wife that eventually reorganised the collection of paintings and then donated them to the state. They went on display at the Musee de l’Orangerie in the latter part of the 1950s and include paintings by famous arts such as Pablo Picasso, Paul Cezanne, Henri Matisse, Auguste Renoir and many others from the 19th and 20th centuries. So, if you enjoy art from impressionist and post impressionist painters and would also like to see some of the famous Numpheas or Water Lily paintings by Claude Monet but cannot get to his former house in Giverny, then this is a fabulous museum in Paris to discover. 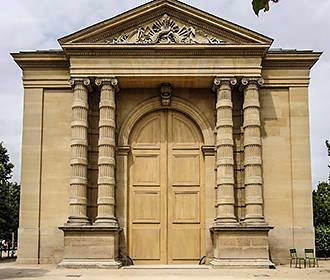 You will find the Orangerie Museum located within the Tuileries Gardens in the 1st Arrondissement close to the Place de la Concorde and, and on the River Seine side of the garden opposite to the Jeu de Paume Museum. This museum in Paris is open on a Monday and on a Wednesday through to a Sunday from 9am to 6pm, yet we would like to point out that it is always closed on a Tuesday along with certain National French holidays such as 1st May, 14th July and 25th December. Plus the last entry is 45 minutes prior to closing time, yet the museum also starts to get cleared of visitors at around 5.45pm. 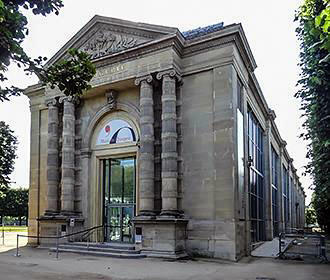 Now you may be pleased to know that the Musee de l’Orangerie is accessible to the disabled, and wheelchairs plus walking sticks are available along with pushchairs and baby carriers for those with very young children. The cost of entry is €9 as of 2014, with a reduced rate of €6.50 for certain people, yet it is completely free for everyone on the first Sunday of each month. But for an additional fee of €6 on top of your entrance fee, there are guided tours in English that are conducted on a Monday and Thursday at 2.30pm and on a Saturday at 11pm, which are approximately 90 minutes and available to individual visitors. However, audio guides for selected works on display are also available in different languages including French, English, German, Spanish, Russian and Japanese to name a few, plus there is a sign language option for the hearing impaired and an audio description available for the visually impaired. And in addition to these, there are childrens audio guides available in English, French and Spanish, and whatever one you choose, these are a cost of €5 but subject to availability at the time of your visit to the museum. And when it comes to getting to the Musee de l’Orangerie via public transport in Paris, the nearest Metro station is the Concorde stop via lines 1, 8 and 12, yet the bus numbers 24, 42, 52, 72, 73, 84 and 94 will also get you very close by. Alternatively, a short walk along the River Seine will get you to the Batobus water bus docking station, plus some of the bus tours like l’OpenTour also stop nearby to these tourist attractions in Paris.